Nguyen Dang Cuong, a veteran shipbuilding engineer, who has held many important posts in the shipbuilding mechanical engineering and fisheries industry, said at a workshop recently that five to six main engines selected for the program include Chinese-made ones. “My viewpoint is that these Chinese machines must not be considered,” he said. “The main engine is the vital thing of ships. Therefore, we must use the best for the fishing boats we are building. Chinese products mean low-quality or counterfeited ones”. However, China also makes advanced machines with modern technologies, but Vietnam cannot approach such technologies. As for middle-quality engines, Chinese products are much worse than those made in Germany or Japan. Another expert, agreeing with Cuong, cited security reasons. “If we use Chinese engines, we will be reliant on the country’s spare parts and maintenance,” he said. “Everyone knows that the risks are very high in the current circumstances. We’d better not depend on the supplies from the country”. Cuong suggested that it would be better to choose a limited number of engines for fishing boats. The use of many different engines would cause big difficulties in five years, when fishermen need to replace parts and accessories, and engineers will have to deal with many kinds of machines with different designs and technologies. “Vietnamese fishermen and engineers are familiar with common machines. Yanmar engine, for example, has been favored by farmers,” he suggested. The fishing boat samples introduced by SBIC, the largest shipbuilding corporation in Vietnam, still cannot satisfy farmers’ requirements. Cuong noted that the paddles designed by SBIC are not suitable to all waterways in Vietnam. “When looking at the designs shown by SBIC, I feel as if they are just transport vessels with some additional holds for keeping fish,” he noted. “I believe that the designers of the boats do not have any knowledge about fisheries,” he added. He went on to say that fishing boats need to be designed in a way to make boats usable in different waters with different conditions: passage, waves, weather, fishing practices, fishing conditions and the kinds of fish they target. One model cannot fit all. 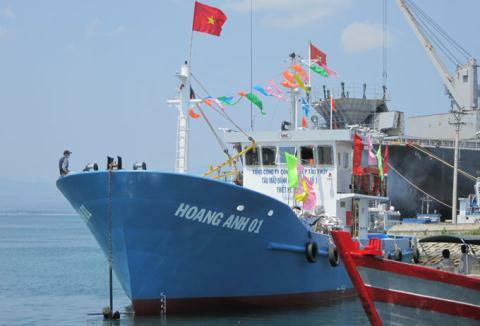 The VND10 trillion program on building fishing boats is a national program approved by the National Assembly to support farmers’ offshore fishing, a part of the strategy to develop a sea-borne economy.